India’s political battle has spiced up and is clearly making waves in the digital sphere; we can all come across multiple content pieces by both the parties on various social media channels. Two of the biggest parties are locking horns this month in what would be a battle of epic proportions. A key aspect of this election is the digital footprint of BJP and Congress. It’s Narendra Modi Vs Rahul Gandhi. Let’s look at some interesting stats and see who is winning this war on Social media. BJP vs. Congress – Who is Winning the Digital Number Game? Being the ruling party and quite a popular one among the youth, it is not a surprise that BJP is leading in terms of follower count on every Social Media platform. With Prime Minister Narendra Modi himself being the flag-bearer, the following count of his account and the party’s account has increased massively. BJP is leading with maximum followers all channel and also, Narendra Modi is one of the most followed Leaders of the world across Social Media. Surprisingly, Rahul Gandhi has very few followers in Youtube and LinkedIn channels, whereas Modi is quite popular there. BJP vs. Congress – Who Is Spending a Lot of Money on Advertisements? Facebook keeps restriction on its election-based ads as soon as it finds out if a particular ad is trying to influence a person. With Facebook allowing transparency in the amount of money spent by each page on Facebook, we can arrive at some remarkable numbers. In the last 7 days, (March 31 to April 6), Congress has been a generous spender on the platform. In the weekly gap, the Facebook page of Indian National Congress saw a total of 194 ads and spent a whopping amount of Rs. 19,83,759. Whereas the Bharatiya Janata Party (BJP) wasn’t even in the picture. So, Congress is trying its best to spread out their reach as far as possible by spending way more than its rival on the Digital Front. But is Congress ahead of the race at the moment? Let’s look at some other figures that might blow your mind. 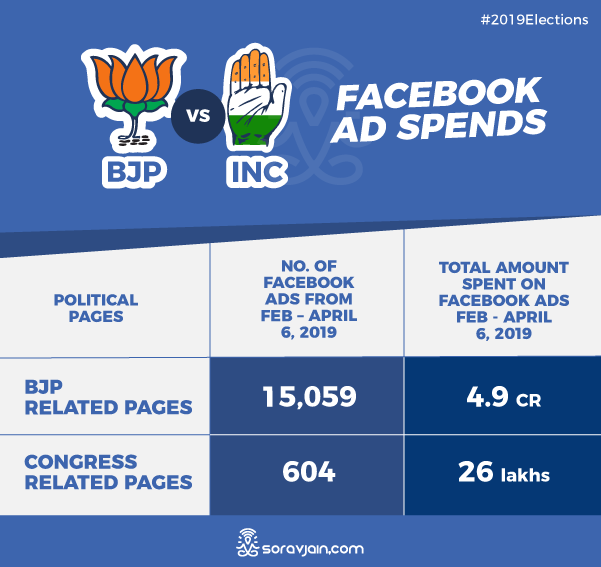 Of the top 20 pages that spent the most on Ads in the past 2 months (Feb 2019 to April 6, 2019), there was only one Congress related page, which was the official page itself. Ranking at No. 12, it spent Rs. 25,75,670. But BJP surpassed the Congress by a huge margin with 7 pages making it to the top 20. The page that spent the most was ‘Bharat ke Mann ki Baat’ which spent Rs. 1,15,62,550 on 2498 ads. What Does Google Search Behavior Say? Okay, let us assume Social Media numbers can possibly be dubious! Maybe most of the pages and fan clubs of Narendra Modi are by his party that’s what a lot of Modi haters must be thinking by now. So let’s go by the search trend and analyze how many people search for Narendra Modi /Rahul Gandhi. After all, Google doesn’t lie. I did a trend analysis of last 90 days to understand what people are generally searching for and here are some interesting insights without any exit poll. If this possibly comes true then Google Trends are no less than exit polls that those news channels usually run. As per Google Trends, Majority of states show a massive interest in Narendra Modi. Kerala is 66% for Rahul Gandhi and Tamil Nadu is 54% for him respectively. The blue wave above shows the infinite growth of the party this year across the country and I totally believe in Google Trends! Let’s see if these predictions come true on Results Day. For months BJP and its supporters dominated the political battle on the social media platforms, but lately, the party seems to be facing heavy backlash on social media. Anti-BJP hashtags are trending almost every day, on top of that number of right-wing handles have been suspended by Twitter and Facebook for posting abusive content. Narendra Modi vs. Rahul Gandhi – Who Has A Better Fan Club? BJP related pages included, Bharat ke Mann kiBaat,My First Vote For Modi, Nation with Namo, and the official page of Bharatiya Janata Party. There are multiple other pages that have more than a million followers like Modi Followers, Modi Government Updates, Our PM Narendra Modi, I support Narendra Modi, Modi News, Mission Modi 2019, Modi Mania, I trust NarendraModi, etc. I believe my blog post would be full of pages if I start typing down all the pages of BJP and of Narendra Modi and his fan club. BJP’s influence has even spread to Quora. This is reflected through more questions about BJP than on Congress. Apart from that, there are more good reviews for BJP than Congress on Quora. You can see yourself below; when I searched for Narendra Modi on Facebook, I only found all positive pages about him on top. Truly shows the sentiments of his fan club. On the other note, when I was searching for Rahul Gandhi and how strong his fan club is, to my surprise I didn’t find any pages other than his troll pages on Facebook on the listings. This shows that Narendra Modi’s Digital Identity is much larger and stronger than Rahul Gandhi’s. Narendra Modi wins the battle on Social Media for sure. And I am truly impressed by the fact that how each of these unofficial fan pages has unique styles in itself. Modi Vs. Rahul Whose Merchandise Is Selling More? Not just across Social Media and on Google, let’s also look at Amazon and how India’s most popular shopping website have lot more creative collection and buyers for Modi’s Tshirt when compare to the T-shirts of Rahul Gandhi. Namo Again, Main Bhi Chowkidar, Modi Fir Ek Baar, are the T-shirts that are selling well on Amazon. Let’s look at some of the Modi’s Merchandise (Please do look at the average reviews, there is some visibility when compared to Rahul Gandhi’s merchandise where there are no reviews, that also means there are not many buyers). There are buttons, diaries, mugs and a variety of T-shirts and hoodies if you intend to show your support to Narendra Modi. For Rahul Gandhi, there are hardly any merchandise and even if there are few, they don’t have much ratings. Content Strategy and Approach of BJP and Congress What’s Good and What’s Bad? The Digital Song: Which one received more views? Taking on YouTube, both Congress and BJP released a song on the same day and hence making our comparisons easier. Surprisingly, the overall metrics of Congress’ YouTube channel are better than BJP’s. Even though BJP uploads close to 40 videos a day and Congress sticks to 4 to 5 videos, Congress’ views per video are way more than what BJP’s videos have managed to garner. Congress’s video has garnered 9,00,000+ views but the channel has disabled likes and comments, so we are unsure if it is a genuine video view or fake ones. Where BJP garnered 2.2 Million views on their song titled, ‘My first vote to the one, one and only one who has got everything done’ with 4,000+ likes. Another song from BJP ‘Haan Mai Bhi Chowkidar Hoo’ has garnered 1. 1 M views with 92,000 likes and 4.5K dislikes and 11,438 comments. Manifesto Approach: Who handled it better? One of the biggest wins of Congress is their Problem + Solutions approach as in Digital Marketing something which is very important is identifying the problems of an individual and addressing them through your communication practices. Narendra Modi’s tweets in the last few months have majorly been about his rallies and his talks. Whereas, Rahul Gandhi has been smartly addressing the problems of India. Some of his tweets below make a lot of sense. In the problem plus solution approach, Rahul Gandhi makes a big win. Just a day before Election campaigns are supposed to get over Modi launched his 10 points Manifesto which made a big wave. Though it was late when compared to congress, it was at least better than talking about rallies. Modi did take a great mileage out of the anti-missile launch which immediately triggered a lot of appreciation from media and people across India. Though this was not part of the election campaign, he took this opportunity to promote and this was rightly done on time. Also, great proof of Chowkidar initiative. Rahul Gandhi took centre stage on social media by announcing that he is contesting from Wayanad. While everything was going right for Rahul Gandhi, he was criticised by a section of Social media for ignoring Amethi. However, now that Rahul is contesting from Amethi too, it is a perfect decision with respect to the pulse on social media. Both BJP and Congress have an active presence on Facebook and they have created a number of pages for the respective regions in order to target the locals. They have dedicated Facebook pages for each state and have maximized their presence by promoting their party’s message in their respective native languages. Both BJP and Congress had respective pages for each State. On an average BJP outranked Congress on the volume of page likes for each state. Congress also fell short on the number of pages. Given below are some of the core state pages of both the parties with the maximum likes. Apart from concentrating on their efforts on Social media marketing, BJP ensured that they get maximum coverage from other sources. 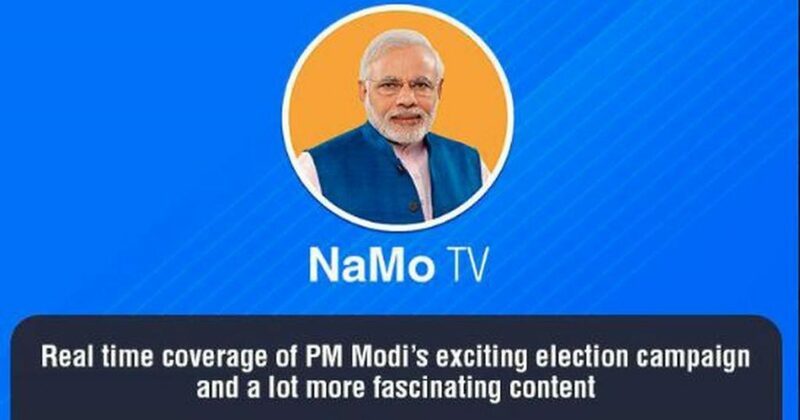 BJP has launched its own TV channel called NaMo TV which is practically just a slide show that highlights BJP’s past achievements. In an effort to widen their reach BJP released an exclusive biopic based on the real life of Mr. Narendra Modi. The trailers received good reaction and were shared rampantly across all social media platforms. Apart from that BJP also promoted the launch of “The Accidental Prime Minister” which was a movie based on the Ex-Prime Minister Dr. Manmohan Singh. Lately the Election commission has stalled the biopic’s release, but BJP’s contingency plan was to release a 10-part web series based on Modi’s life which is currently available on Eros Now. This has further fortified their presence on all media platforms. India is WhatsApp’s largest market with more than 200 million users and this is a platform which makes users forward content with ease. Both the parties effectively utilized WhatsApp to mobilise their party supporters and cadres. WhatsApp groups proved to be an effective tool to accomplish this. BJP strategized and created enough WhatsApp groups for different sections of the community; in this way, they were able to access people from various walks of life. As per time.com BJP had approximately created three WhatsApp groups for each of India’s 927,533 polling booths. Each group has a minimum intake of 200 members. The number of group chats could reach more than 700 million people out of India’s 1.3 billion population. Majority of the population are in multiple group chats and in general most of the chat groups have lesser than 250 members. This strategy is widely different from the last elections in 2014, as only 21% of the Indians owned a smartphone. Currently this number has doubled to nearly 39% and for most of them WhatsApp is the default social media app of choice and on an average more than 90% of the smartphone users have it installed. Congress wasn’t effective with their WhatsApp targeting, and they weren’t able to reach that many people using this strategy. On the other hand, BJP followed this tactic which helped them to go for targeted messaging and also micro-targeting. Who is leading the political battle in the Digital arena? Despite both the parties putting enough effort, from the observations we can conclude that Team BJP is leading the race and Team congress is way behind in the battle for political supremacy. #MaiBhiChowkidar created a rage. The campaign was a marketing masterstroke. This made it easier to track supporters as lakhs of supporters prefixed ‘Chowkidar’ on various platforms. One of the reasons BJP doesn’t need to spend much on Ads is that they have some campaign in trend at any point in time.BJP’s Chowkidar campaign has been received with great fanfare. 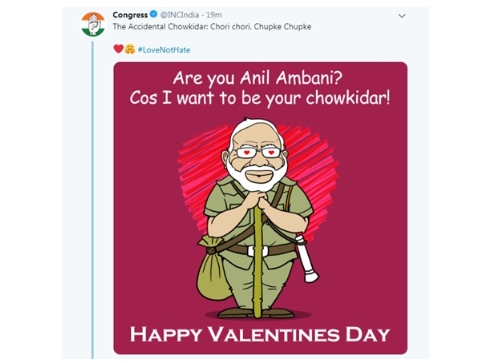 The #MainBhiChowkidar campaign on Twitter became a hot topic to talk about on almost all the social media platforms. After the Chowkidar movement, #MaiKamalKhilaneAyaHoon, #BJPWinning, and #NorthEast4Modi were found trending. No Congress related hashtag could make the cut in this brutal battle and the only #ParivartanBusYatra made a little impact. BJP is clearly winning the hashtag war as their hashtags are clearly making an impact. Now every time they tweet or make a Facebook post, they make an impact in promoting the brand’s ideal message. A Perfect User Generated initiative. One of the fastest selling content on internet is ‘Memes’ anything conveyed in Meme style garners a lot of ‘Ha-Ha’ and shares across on Social Media. Both the parties have several pages un-officially that has made some greatest memes of all times. Memes are generally not found on official channels, but it’s totally different this time. BJP revamped their meme game by using Game of Throne references. Given below is an example. In their effort to reach their supporters, both the parties came up with the idea of innovative contests. Some of these contests were held from unofficial pages, however it drove engagement and created hype on many social media channels. 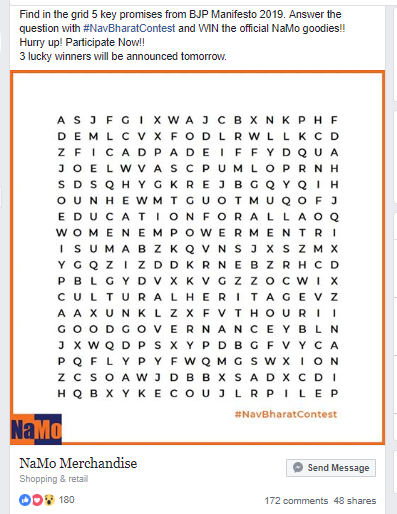 Given below is an excellent representation of how BJP used the contest concept to drive engagement. Where did both the parties fail? You might have heard about retweets and reposts becoming trending phenomenon, but off-late BJP’s biggest stint in their online political campaign has been copying and pasting the content from one common document. Pratik Sinha co-founder of Alt-news recently exposed the mechanism of the BJP party members using a clever strategy. He was able to access the master document, from which the party’s ministers, workers and IT cell members copy-pasted tweets to their profiles. This common document was designed by the party and was open to editing by anyone, and Pratik Sinha took advantage of this loophole. The edited document was retweeted by several members of the party including the Union Minister Pon Radhakrishnan without giving it a second reading. This resulted in BJP party members, tweeting against their own party by showing BJP in a bad light. After the revelations by Pratik Sinha, the tweets were later deleted. By the above-mentioned stats and facts, it can be concluded that the Political Parties are taking the power of Digital Reach very seriously. Various Ads, campaigns and movements are run online by both the contesting parties as a part of their Electoral outreach. And it is in our hands to make or break them. After all, Social Media fan base a strong weapon of the people, for the people and by the people. Which party’s campaign made a positive impact on you? Let us know below! You just hit the Bull’s Eye. The best take ever. Comparison at it’s best. Undoubtedly Modi Ji Utilised Digital Platform to the max. This is such a great great analysis. Well done, Saurav. Hi Sorav, thanks for curating so much of facts, compiling and sharing it with us. Actually, I was looking to write such piece of content but I neednot more. one of your best article thanks for providing such a great information with us.